Radon is a naturally-occurring gas that can penetrate your home and cause serious health risks to you and your entire family. Radon testing is the only way to know for certain if your home has dangerous levels of this odorless and invisible gas. If high radon levels are detected in your home, The Property Medics can install a customized radon mitigation system that can help reduce the radon levels in your home. We offer radon abatement service in UT, and more specifically in Orem, West Jordan, Sandy, Magna, Midvale, Provo, Logan, Alpine, Huntsville, Eden, and many other nearby towns and cities! Naturally produced by uranium decay in soil. 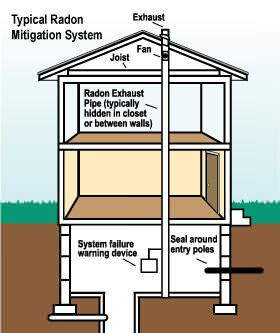 Homes with crawl spaces are at high risk for radon issues. Low doses of radon over time is worse than periods of high doses. The The Property Medics system uses sub-slab depressurization to reduce radon levels. Contact us today for a free radon mitigation quote. Learn about the National Radon Defense network for radon mitigation specialists. Contact us today for a free estimate for radon abatement in Ogden, Salt Lake City, Bountiful, Farmington, Lehi, Centerville, Roy, Spanish Fork, Payson, Tooele, and other surrounding areas!